New Packaging and branding for a range of top quality smoothies, pressed and blended juices. 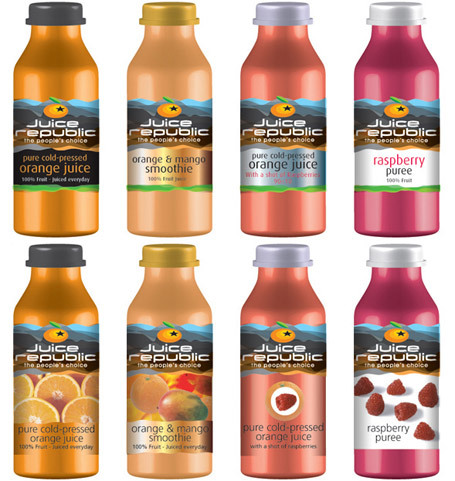 To create a brand (link to brand section) and packaging for new juice brand 'Juice republic' to enable it to compete and outsell its competitors in the crowded juice market. We created a number of concepts exploring 'island life' and other colourful and modern graphic imagery. Keeping a keen eye on budgetary constraints, with four different types of drink and many flavour variants underneath each one, we eventually decided on the most simple route of cap colour coding and change of label materials to both easily identify the variant and be cost effective in production. (See Fig1) The 'Island Life' imagery to be explored further as the visual identity of supporting materials, such as website, advertising etc.